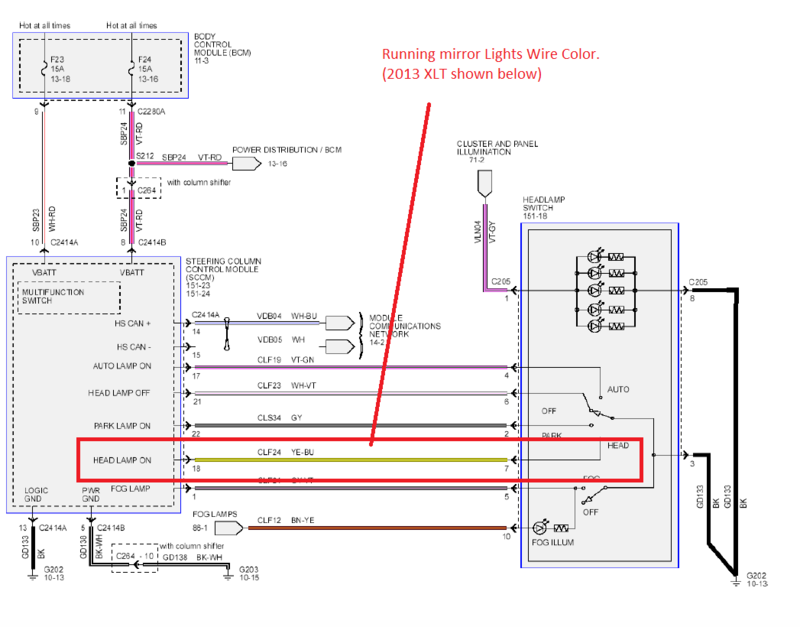 How to determine which wire to use for your 2009-14 running mirror LED light kit for automatic on/off with your headlights. Once you have installed your LED lighting into the mirror housing and you have run your wire into the cab of the truck, its time to use a quick splice connector to connect for power. But which wire? To have the lights activated automatically on and off with your headlights please follow this simple step. Open the hood of your truck and determine the color wire that is connected to your side marker lights. Match this color with the color wire found at your passenger foot well panel and connect to it using the easy quick splice connector as seen in the install video. Another option is to look up the wiring guide for your year/model F150 and connect to 'HEADLAMP ON' wire as indicated. Here is an example wiring guide (in this case the wire control modules for headlights from a 2013 XLT, you will need to use the correct guide for your year/trim level). You can see that it indicates the HEADLAMP ON wire is YE_BU (or yellow-blue) so this would be the color you would connect to at your passenger foot-well wire panel.